Edward Snowden received eight public nominations for the 2014 Nobel Peace Prize. 2014 Nobel Peace Prize was awarded to Kailash Satyarthi and Malala Yousafzai, but Edward Snowden was a high-profile candidate for the prize, whose eight public nominations provoked a great deal of debate. Academics, parliamentarians and former prize winners are among the groups eligible to make nominations for the Prize. Edward Snowden’s Nobel nominations are listed in order of their announcement. On 13 July 2013 Stefan Svallfors, Professor of Sociology at Umeå University in Sweden, announced on Twitter that he had submitted a formal nomination of Edward Snowden for the Nobel Peace Prize. He also released an image of the letter he sent to the Nobel Committee for the nomination. Professor Svallfors cites Edward Snowden’s “heroic contribution” at, for him, a “great personal cost”, and states that Snowden has shown people that they can “stand up for fundamental civil and human rights”. Professor Svallfors also refers to the Nüremberg trials, which ruled that: “I was only following orders” may never be used as an excuse for acts that violate civil and human rights. 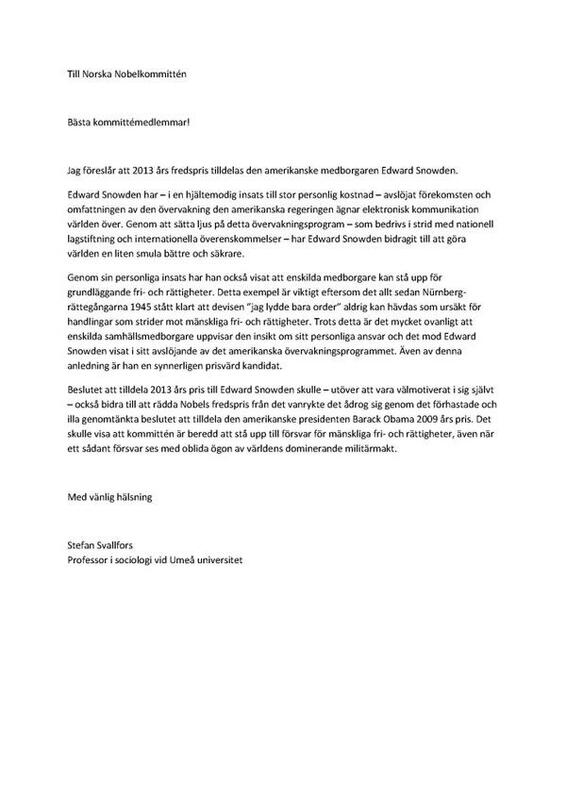 On 17 July 2013, the Swedish newspaper Ystads Allehanda reported that Professor Marcello Ferrada de Noli had nominated Edward Snowden for the Nobel Peace Prize in a joint nomination with Julian Assange and Chelsea Manning. On 29 January 2014 it emerged that Norwegian parliamentarians Snorre Valen and Baard Vegar Solhjell, a former government minister, had also nominated Edward Snowden for the award. The two parliamentarians stated that “The public debate and changes in policy that have followed in the wake of Snowden’s whistleblowing have contributed to a more stable and peaceful world order.” The full text of their nomination letter is available here. On 31 January 2014 – the final day for nominations – the Green / European Free Alliance group in the European Parliament announced that Edward Snowden was their nomination for the Prize. The Green / EFA group has 58 MEPs, making it the Parliament’s fourth largest. Also on 31 January 2014, Die Linke – the 64-strong left grouping in the German Bundestag – announced that Edward Snowden was also their nomination for the Nobel Peace Prize. On 3 February 2014, the Pirate Parties announced that all qualified members of Pirate Parties internationally had jointly nominated Edward Snowden and Chelsea Manning for the Nobel Peace Prize. The nomination letter was sent to the Nobel Committee from the Brussels office of Amelia Andersdotter MEP on 31 January 2014 and was signed by herself, the other Swedish Pirate Party member of the European Parliament, Christian Engström, and the three Pirate Party members of the Icelandic Parliament (Birgitta Jonsdottir, Helgi Hrafn Gunnarsson and Jón Þór Ólafsson). Pirate Times has translated the nomination letter into French and Spanish.